Speed is the rate of change in position of an object, regardless of direction of travel. Walk forward or backward at 2 meters per second, and your speed is just that: 2 m/s. 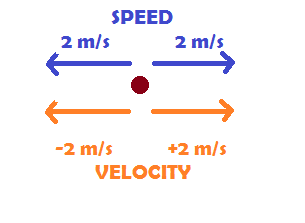 Velocity is speed in the context of direction. Say you were walking backward again; your velocity is negative 2 m/s, although your speed is still positive. For most science applications, the SI unit for speed and velocity is meters per second (m/s), although kliometers per hour (km/h) is sometimes used when measuring the speed of vehicles. The English system usually expresses speed as miles per hour (mph) or sometimes feet per second (ft/s), while marine vessels typically use knots, or nautical miles per hour. To simply convert from any unit into meters per second, for example, from 5 mph, just multiply by the conversion value in the right column in the table below. To convert from m/s into units in the left column divide by the value in the right column or, multiply by the reciprocal, 1/x. To convert among any units in the left column, say from A to B, you can multiply by the factor for A to convert A into meters per second then divide by the factor for B to convert out of meters per second. Or, you can find the single factor you need by dividing the A factor by the B factor. For example, to convert from miles per hour to kilometers per hour you would multiply by 0.44704 then divide by 0.2777778. Or, multiply by 0.44704/0.27777778 = 1.6093439. So, to convert directly from mph to km/h (kph), you multiply by 1.6093439. Furey, Edward "Speed Conversion Calculator"; from https://www.calculatorsoup.com - Online Calculator Resource.